A 47-year-old woman named Marie Lollis, who lives in South California, USA, has gone viral on social media for celebrating her divorce with a photoshoot. 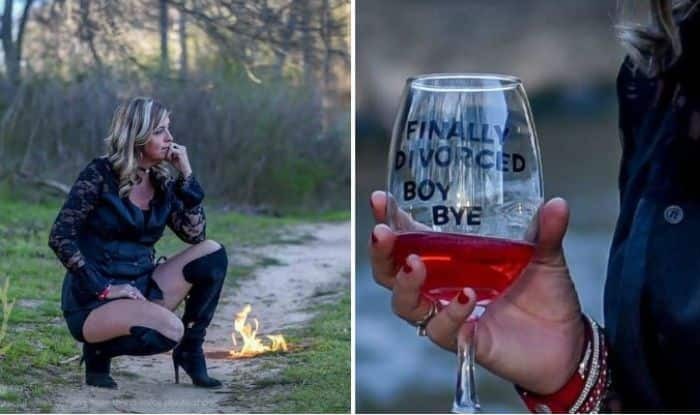 Her photoshoot includes wine, knee-high boots, burning her wedding photography and quirky captions. Dressed in a black outfit and brief, she celebrates coming out of the toxic marriage after long 13 years. Well the US lady is inspiring many women to end their toxic relationship with this photoshoot. In the photos, she also breaks her wedding photo frame and happily poses with the divorce papers. Not only has this she also held a wine glass which reads ‘Finally Divorced’. I wanted to show that strong women can be empowered to move on and be happy. It’s okay to be happy again. I wanted a way to close a chapter in my life my way, and celebrate finally making it official.” She added. The photos have been shared by a Twitter user named ‘The Big Guy’. The post has received 12,120 retweets and 65,273 likes. Marie’s divorce was finalised recently but she got separated from her husband years ago.